Can Westerners get over their romance with turf? Christian DeSouza takes a shot from brother, Noah, in their suburban Denver backyard. Parents Chris and Sarah say they love their lawn -- with three boys (including youngest son Jackson), two active adults and two black Labs, grass is the only option. PHOENIX, Arizona — On the eastern fringe of the Phoenix suburbs, where strip malls interweave with subdivisions and cotton fields, Arizona State University horticulture professor Chris Martin is thinking about water. During the latter days of the longest dry spell in city history, under a desert sky that’s dull with dust, Martin is studying the fraught relationship between yards and the people who plant, cultivate and irrigate them. Arizona State’s Polytechnic campus used to be Williams Air Force Base, and the place has a hastily remodeled feeling, its 600 acres of real estate hanging loosely around its small student body. On the northern end of campus lies a development of about 150 homes, former military housing now occupied mostly by students and their families. The one-story houses are unassuming in the extreme, distinguished only by the color of their stucco and the number of their bedrooms. Martin and his colleagues — sociologists, biologists, chemists and others associated with an urban ecology research program at Arizona State — recently introduced some variety into the neighborhood, and not everyone is happy about it. "These people were ecstatic, of course," Martin says, gesturing at a half-dozen homes arranged around a neat horseshoe of deep green turf. "But the people who lived in the native treatment — now, they were bummed out. They said, ‘We’re going to have native plants in our yard? You mean cactus? Oh, no.’ "
Though this neighborhood is an unlikely laboratory, it’s the perfect place to study the lure of the suburban lawn. Before Martin and his fellow researchers arrived, these yards were little more than bare soil and dormant Bermuda grass. The investigators chose four groups of six houses each, then overhauled each group’s backyard landscaping. The first got the lush spread of turf; the second an "oasis" landscape, with desert and subtropical plants interspersed with patches of turf; the third a variety of desert plants, each drip-irrigated and surrounded by granite gravel; and the fourth the unpopular "native" treatment, a sparse selection of Sonoran Desert plants with no supplemental water. Martin and his colleagues are now comparing these yards with the rest of the neighborhood, looking at who uses them and when, what kind of wildlife habitat and climate they create, and whether or not the residents are pleased with the changes visited upon them. That last question may not need a lot of analysis. "We talk about how we like desert landscaping, but when we close our doors, most of us just want our turfgrass," says Martin. "Green is still really important." Many people see landscaping as a long to-do list, a tedious cycle of pruning and mowing and mulching. But seen through Martin’s eyes, yards are a tapestry of human needs, illusions and habits, of practical and unconscious desires, unrolled outside for all the neighbors to see. And while the desire for cushiony, generously irrigated turf persists in the desert, change is afoot in Western yards. The lure of the lawn is such a powerful and peculiar force in our national culture that otherwise mild-mannered historians describe it in extravagant terms. Ted Steinberg, in his entertaining study American Green: The Obsessive Quest for the Perfect Lawn, calls the rise of cultivated suburban lawns "one of the most profound transformations of the landscape in American history." Lawns have their roots in the manicured gardens of England, and European grasses made their stateside beginnings as livestock pastures. American yards as we know them developed after the Civil War, reaching their full, chemically enhanced flower during the post-World War II suburban boom. In The Lawn: A History of an American Obsession, Virginia Scott Jenkins explains that the golf industry, eager to develop drought- and heat-tolerant strains of turfgrass for its courses, supported federal turf research that helped residential lawns spread throughout the Sun Belt and the rest of the Interior West. Turf was no passing fad. Last year, researcher Cristina Milesi at the University of Montana reported that turfgrass — on lawns, parks, ballfields, and elsewhere — is the largest irrigated "crop" in the United States, occupying three times more land than irrigated cornfields. Suburbs are one of the fastest-growing land-use types in the entire world, so turf’s reach and influence are on the rise. The lawn is indebted to decades of savvy turf-industry advertising, but what else explains its persistent appeal? Theories abound. Lawns might recall the African savannahs where the earliest humans lived and hunted; they might spark memories, especially for those of Northern European descent, of ancestral forests and moist meadows; or they might represent the "pastoral ideal," the pervasive American dream of escape from the dirty city to the quiet, healthful country. Layered atop these unconscious motivations are more practical reasons to love the lawn. 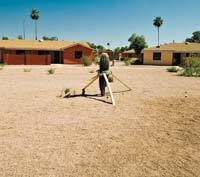 In the Arizona State experimental neighborhood, the tricycles and pop guns scattered on the lawns attest to their family friendliness. Turf (at least the chemical-free kind) provides a safe, soft place for toddlers to play, and a comfortable spot for adults to gather and relax outdoors; a well-mowed lawn is acceptable to the crankiest of neighbors; lawn upkeep, though often expensive and time-consuming, requires few decisions and little risk, thanks to decades of R&D by the lawn-care industry. Some landscape architects suggest that lawns also encourage community cohesion: Open, flat front lawns allow more socializing among homeowners and passersby than shrubbery and stands of trees, and may even reduce crime by ensuring a clear view from the front porch, thus putting more "eyes on the street." "In theory, at least," writes food and gardening journalist Michael Pollan, "the front lawn is an admirable institution, a noble expression of our sense of community and equality." But this admirable institution comes at a steep price: $40 billion. That’s how much homeowners spend each year on the care and feeding of turf, an exotic crop imperfectly adapted to most American climates. To be sure, this massive outlay buys plenty of pleasant croquet games and backyard parties. But it also buys nitrogen-rich fertilizers, which can end up in streams and oceans, causing algae blooms, degrading water quality, and killing fish. It buys toxic lawn chemicals, which can be tracked inside houses; dubiously designed lawnmowers, which burn and mangle tens of thousands of people every year; and gas for mower engines, even the newest of which, proportional to their size, emit 93 times more smog-forming pollution than late-model cars. And in the West, the highest price is paid in water.